Attached to my parents mailbox. Now they can see from the front door whether the mailman has come or not. Especially helpful on the days they had nothing to mail out. I would buy more if I had more boxes. I am a disabled vet with a mail box out front, about 100 ft. The other is at the bottom of my chair ramp, about 60 Ft. I can see both from inside my house. My mail lady puts larger mail in the ramp box. She loves these. I asked all over Huntsville, AL with no help, checked other mail outlets. I knew that I could find them at Drake. I will tell other handicapped people about them. I had to drill two holes for each, but it was easy, I think they will last a long time. By the way, I replaced the yellow ball with a USA Flag ball. My house is decorated with USA Flag objects inside and out. I love this mailbox gadget. It has saved me so many trips to the mailbox. Bright yellow ball is very easy to see. We would always walk to the mailbox at work and never know if the mail was there. This can be seen from inside the office so it saves a lot of wasted time. Great product. I have owned one of these for years until it was stolen. I am so glad to see it back and can't wait for the new one to arrive. It's perfect on a rainy day! I had a mailbox alert for 15 years, before it finally succumbed to metal fatique. I was very happy to see they were still available to buy; I love knowing when the mail has been delivered. really like it,but so do the mockingbirds..they soon destroy the ball. 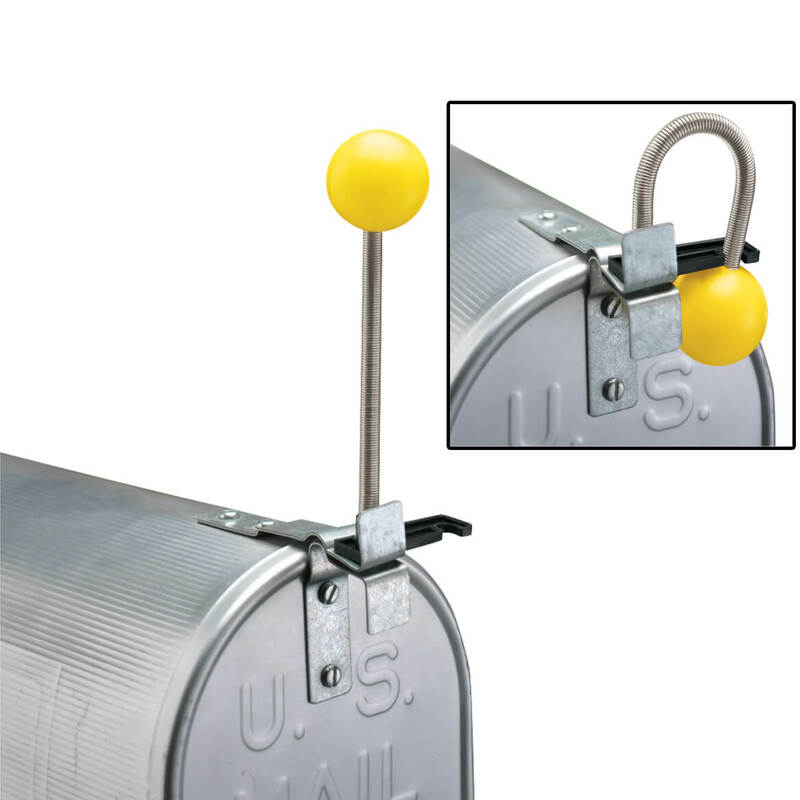 This is a great invention and we Love our mail signal ball!! I have ordered extra ones as I give them away as unique & useful gifts to family and friends. They are especially appreciated as we have a long driveway and we don't have to keep checking when our mail has arrived. So useful in the cold, rainy weather especially!! It was just as it was pictured, and it works! Will last longer, easier to use. I wanted the earlier model but this one works better and will probably last longer because it doesn't have hinge to get rusty. I purchased one of these about 10 years ago and it's till out there on the mailbox and still working. I thought I'd be safe and purchase a back-up of it. I love that it saves me wasted trips down the long driveway to the mailbox plus it can so easily be seen when the mail has come. This winter was brutal, this saved me from unnecessary trips on the ice and snow. Now I know when I have mail...for sure! This little yellow ball tells me when the mail has been delivered. Saves many usless trips across a very dangerous highway to do the "mail check". I have recommended this to a friend. She didn't know this little trick even existed. She's getting one for herself and one for her son. Mail Sign - What a Nice Help! A couple of our neighbors had this device on the mailbox. I wanted one but couldn't find it at any of the hardware stores or stores I checked. I was glad to see it advertised in your catalogue. It has saved me lots of steps to the mailbox when the mail has not arrived. I can easily see the ball (which I painted red) from my kitchen window. This is a simple gadget, but a real help for me. This is a great buy! This is GREAT! No more needless trips to the mailbox in the 100+ degree heat! This saves me a lot of time from checking if the mail has run. Love the invention! Just what we needed so we don't have to run all the way to the mailbox. Our mailbox is quite a distance from the house and this is perfect for us. I really like the Mail Sign. Our mailbox at work is about 0.1 of a mile from our office and not in a direct line from the office and now we can tell when the mail has come when we get about halfway to the box. No more walks to the box only to see the flag up when we get within arm's length of the box. I love this. No more trips to the mailbox to see if mail had run. Love it. Easy to install and use. Saves steps to check if mail has come. With my mailbox about 50 yards from the house it really prevents useless long walks in bad weather which in Central NY is just about every day. Spring drooped when yellow ball filled with rain water. Unscrewed ball, drained and screwed back with good results. i previously had mail box alert but 20 years old and ball disappeared i really missed it so i was delighted to find it on your web site!!!!!!!!!!!!!!!!! This saves me from having to exit my car to check an empty mailbox. I can see it from a distance so I don't have waste time walking to an empty mailbox. come than walking down to the mailbox every time. I love the idea, but it doesn't fit my mailbox. It is useless because it doesn't fit my mailbox. Love not making those repeat trips to the mailbox. This is one of the best items I have ever bought. Saves long trips to the mail box not knowing if the mailman went by. Miles Kimball was the only place I could find one,. Every mail box should have one. I have used this for over a year now, and would be lost without it. I've had a yellow mailbox FLAG for years and loved it. My rural box is across the road and the house is set back from the street. The flag saved me steps and time almost daily. I was dependant on it. It finally broke and I searched for a replacement with no success. Finally gave the little ball on a spring a try. I'm so disappointed! It's barely visible from my window and then, often, I can't tell what position it's in. Besides that my son-in-law had to drill new holes in the mailbox to install it. It would have been nice if they had just matched up. The unit will not fit on any boxes with plastic handles or fittings. The newer, standard rural mailbox does not have the two top metal brackets to open and close the door. As a result additional hardware is required on many rural mailboxes for this item to function as advertised. 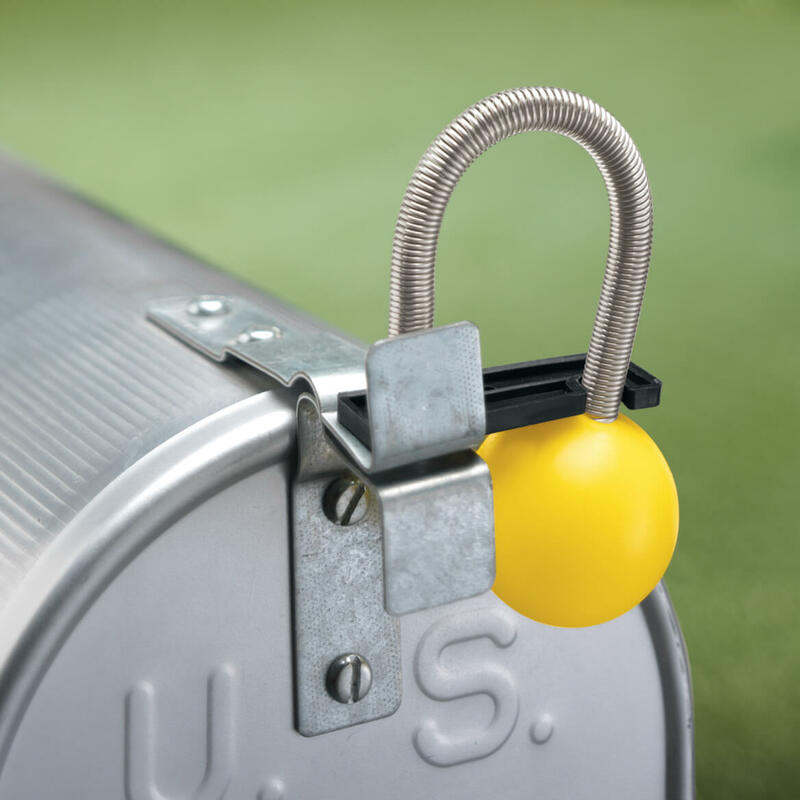 It's a great idea and I wish I could use it, but it can't be attached to my type of mailbox, which is the large Rubbermaid one that does not have the metal opening brackets. It is not a unique or custom-made mailbox; it is carried by all the major hardware stores. The only way to attach this signal balI would be to drill holes in the top of my mailbox, and that wouldn't guarantee that the pop-up would work properly -- and then I'd be stuck with holes in my mailbox. The description should carry a warning that the mailbox must have a metal opener bracket. Bummer. I was looking forward to not hiking to check if the mail had come. very simple to install.Works perfect. 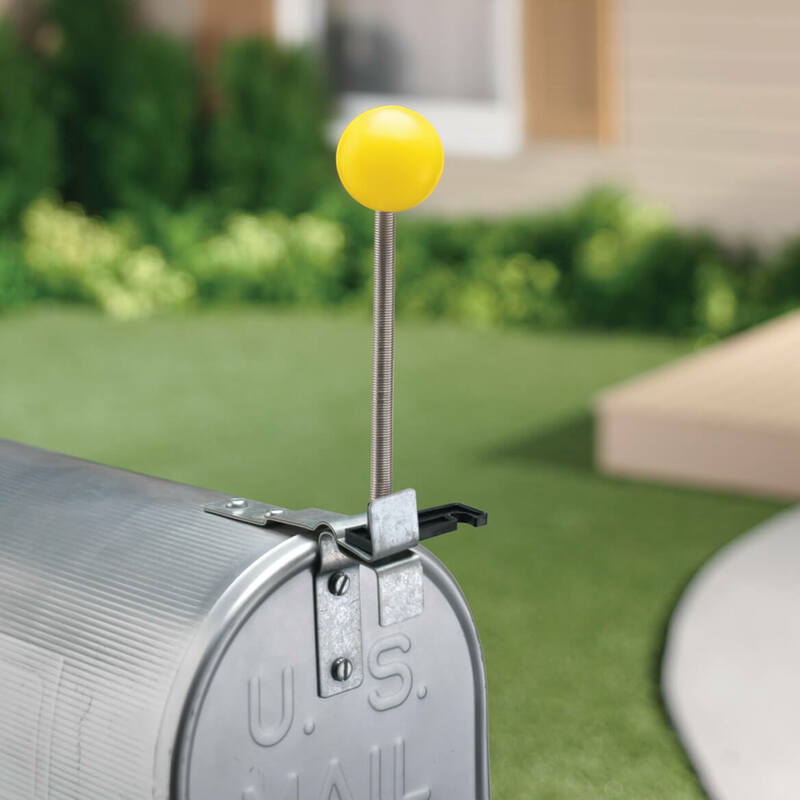 I installed it on my mail box, when the mail arives the ball pops up. Great time saver.I have used mine for over 1 year,I installed another ball by drilling a hole into new ball & screwing it onto the spring(hollow golf ball) then I painted it W/ bright paint. I also have bought 2 more for some of my cousins. I think this would be a time-saver. My mail box is not near my house and this flag is easy to see. To know when the mail carrier delivers mail without constant walking to the mailbox. I have one & love it ordering one for my neighbor who wants one. Over the years members of my family have ordered many of these, not only for our own use but as gifts. They are a godsend for those who have a distance to walk to their mailbox or for the elderly who don't want to make multiple, unnecessary trips to their mailbox just to see if their mail has arrived. We are far away from the mailbox and now can tell when the mail is here from the house. Now I will know when my mail is here,Glad that I seen this. I never know when the mail comes and now I won't walk out to check. Post comes at different times here so this will really help. My mailbox is a distance from my home and this ball saves me many steps. I have one now but it is 9 years old and the spring is getting weak. Well worth the money I paid. We make various trips to the mailbox some days to check the mail because it wasn't there the first time. Live on a dirt road and the mailbox is 1/2 mile from house. This way I can see if mail has been delivered and my husband does not have to stop if I already got the mail. Had the need and found the solution. Easy to know when mail has arrived. I like to know when my mail is delivered because i have health issues and cannot keep going to the mailbox. This is a wonderful gadget. have had 1 for years and then ball split and you did not have and kept looking and it now available so ordering. My parents love it so getting them another too. To try it out, looks as if it might be good. Couldn't find this anywhere else. I hope this works. It's a long walk to my mailbox. My house is a ways from the mailbox and I dont always see the mail carrier. This visual aid is helpful. No other catalog carries this item. It was exactly what I was wanting to order, but have never seen anything like this offered before anywhere. IT SAVES STEPS TO THE MAIL BOX. This appears to be a convenient way to know if the mail has been delivered. no need to keep checking if mail arrived. Elderly 85 year old husband who likes to get mail and can wait for alert to pop up. Have a country mailbox and was tired of trekking out to get mail before it arrived. This could be better as the mailbox door now opens in a strong wind or when a bird lands on it. So I can see when my mail comes without having to go out to look many times. We had one that lastedt longer than another style. Could not find any place locally to purchase one. Needed new flag to alert us as Parent cannot walk that far. It's handy, just what we need to know when the mail has come. It lets me know when the mail has arrived, resulting in no excess trips to the mailbox. Is the spring (to which the ball is attached) likely to rust, or is it made of stainless steel or galvanized steel that won't rust? Thanks, in advance, to all who respond. BEST ANSWER: We have had our Alert Mail for awhile now, and it has never rusted at all. So it must be of stainless steel. I worry about the plastic braking that holds the ball down. But so far so good and I really like it a lot. Our mailbox is about a block away and I can still see the yellow ball when it is up in the air that far away. We've had this item since the spring, thru rain & 1 snow storm w/o any rust. We don't have the side clip to hold it, we wrap it around the mailbox handle. Think the clip would be helpful. Ours came from another co. & either it was lost in the packaging or never available (not pictured in their ad for it). Excellent product, much better than our 1st one. Haven't had any problems with the mail alert ball--no rusting, breakage, or malfunction. We've had it for at least a year and it is used every day. Thank you for your question. This item is designed not to rust. We hope this information will be of help to you. I bought this for my elderly mother and she absolutely loves it. She has not told me of any problems with it. She had it more than a year and never mentioned rust. How do you install it? Does it stick on? is there a screw? BEST ANSWER: It screws on. Very simple to install. I’ve had mine for years and bought one for my neighbor. We both love this handy little device. If the ball is up, you should have mail, if not, no need to go check. I'm sorry, but I can't answer that question. I got this for my sister in another state and she lives in the country.